How have the added bells and whistles affected battery-life in newly released DC-24 when compared to 16-models? Easy to test, so let’s get on it. Looking at specs there is a few differences, DC-24 has a color screen and one more transceiver (The 900MHz) so in general DC-24 should consume a bit more power. Both transmitters were tested while paired to a receiver and fully charged, running on battery. DC-24 was paired to 2.4GHz and 900Mhz. Current consumption was measured with transmitters own telemetry showing us the current drawn by the transmitter in mA. Above are both screens, DS-16 first, DC-24 second. 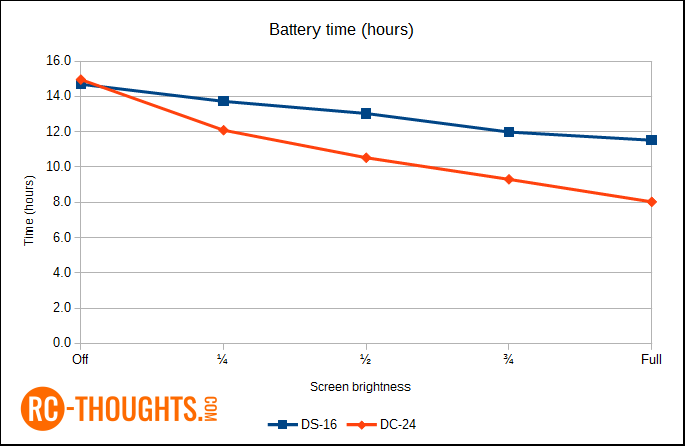 Current consumption chart gives us pretty good perspective how raising screen brightness is the main factor in drawing more current from battery. 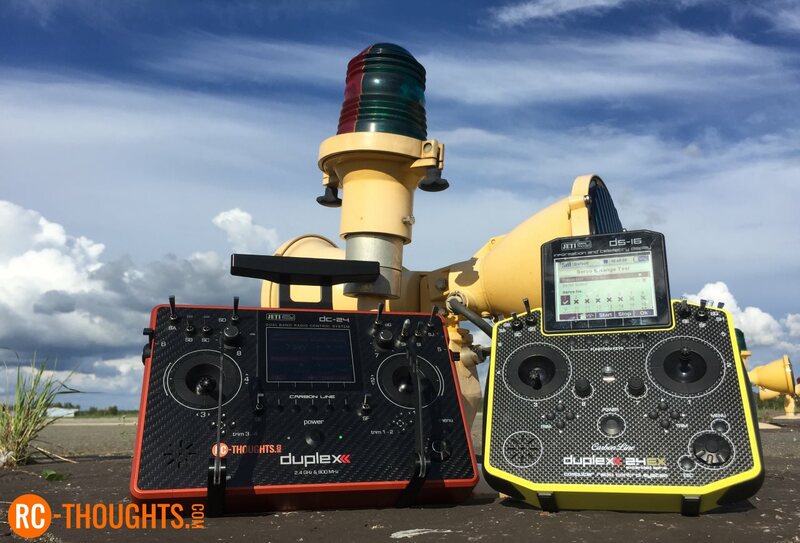 Noteworthy is the fact that in operation without screen backlight DC-24 consumes LESS than DS-16 even with added transceiver! This has to be considered as a very good result by Jetimodel. 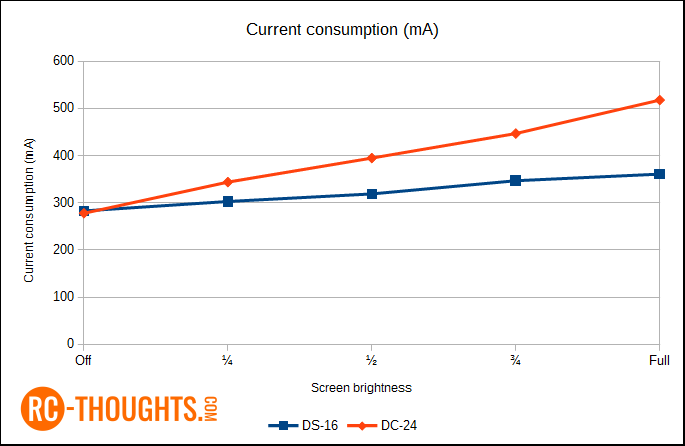 What can also be seen is that raising the level of backlight in DC-24 has remarkably bigger impact on consumption than on DS-16. In fully on position the difference is DS-16 361mAh and DC-24 518mAh, that is ~30% increase. There is a reason, the screen in DC-24 is very bright, I can’t see that anyone would complain about the visibility of the color-screen even in the brightest sunlight. In DS-16 I always used the full brightness (full backlight) but in DC-24 it has settled to 3/4 position. How long can I use my radio? There are two categories on RC-hobbyist’s, those who turn off their transmitter between flights / usage and those who does not. And I’m one of those who usually does not. Backlight off we get almost 15 hours on both transmitters, full brightness gives us a difference on DC-16’s 11.5 hours to DC-24 8.0 hours, so there really is a difference. During helicamps it might affect me but to be honest, this really is not an issue. Since I always need to charge my lipo’s I have power on the field, charging transmitter is not an issue. And there is always the possibility to turn off transmitter between flights. Now, get out and fly something! In place of a single large battery, I'm surprised Jeti did not implement 2 batteries with a DSM like mixing/switch. The new PowerBox Core has done this and provides for Tx battery redundancy. It just seems odd that we go thru the trouble of putting dual Rx batteries in our models, yet we all fly with a single Tx battery.